This was a really fun project for children aged between three and eight. 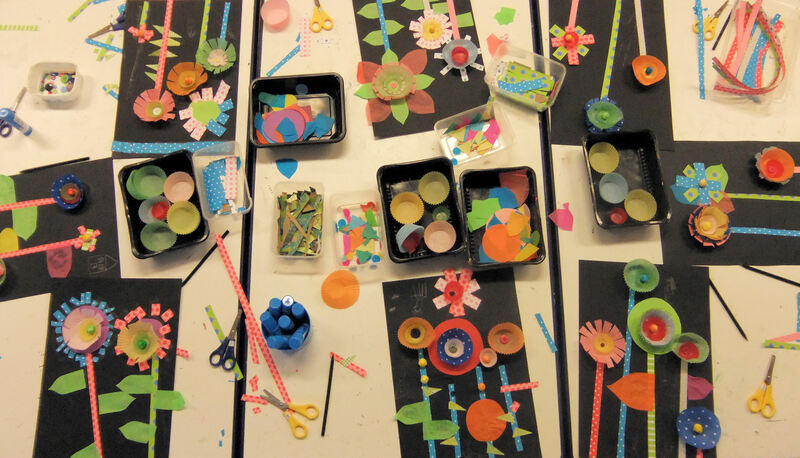 I simply provided the children with scissors, glue and lots of brightly coloured materials – including muffin cases, decorative paper strips, tissue paper shapes, buttons and paper balls – and told them to go WILD! Well… not quite, but in contrast to the previous week’s observational drawing project – Spring Still Life: Grape Hyacinth & Daffodils (February 2015) – when I asked them not to use their imaginations but to draw exactly what they could see, this time I wanted to give the children free rein to work with the materials however they wished. They responded exactly as I’d hoped they would – by creating a riot of colours and crazy shapes! Awesome!! I’ve done a 3-D version of flowers in a vase which I’d love to share. Age range 5-8.